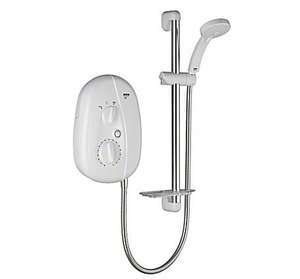 Mira showers are generally regarded as the best on the market, so to be able to pick one up for under £60 is exceptional. Mira Vista is not only good value but its eco settings will save you money on you water and energy bills too. Position of water connection: top left, bottom left and back. Position of electrical entry: top left, bottom left and back. Easy clean - rubber nozzles on the handset help prevent the build-up of limescale. It's an Argos deal, so guess what, it's OOS at all 10 of our nearest stores. Also listed as an online exclusive so I'd assume it was never in the stores? Currently out of stock at 10 local and oos for delivery. Yawn for argos untouchables. No stock in nearest 15 stores. It's an electric shower thus meaning it's crap. so " exclusive" that you cannot buy it either on line or instore. Forgetit has anyone purchased one at this price Where???? There's one problem with this. It's an electric shower thus meaning it's … There's one problem with this. It's an electric shower thus meaning it's crap. and decent 10.5w ones available? Get a Mira Sport Max 10.8kW with airboost. I upgraded from an 10.8 Mira sport old model and this new one is as close to a power shower that I've ever used. Far better than a Triton that'll burn itself out the first time you accidentally leave the pole switch on all day after you've finished your morning shower. If you can find one, this is a hot deal. Far better than a Triton that'll burn itself out the first time you … Far better than a Triton that'll burn itself out the first time you accidentally leave the pole switch on all day after you've finished your morning shower. If you can find one, this is a hot deal. I've fitted many Triton showers, never been back to an issue. Sounds like you were unlucky or had a badly fitted shower. It's an Argos deal, so guess what, it's OOS at all 10 of our nearest … It's an Argos deal, so guess what, it's OOS at all 10 of our nearest stores. I often find Argos stock using ****. This deal is showing as an online exclusive so local stock checking is pointless. OP, probably worth fixing the title as someone is likely to expire otherwise. I've fitted many Triton showers, never been back to an issue. Sounds like … I've fitted many Triton showers, never been back to an issue. Sounds like you were unlucky or had a badly fitted shower. I was unlucky with 3 tritons? Original one replaced twice within warranty. The next time it went out of warranty, it was binned and I got a Mira in that ran faultlessly for 7 years, before I moved house and don't know what happened since. Common issue - one of the capacitors on the two heating circuit boards pop very easily when you forget to turn off the pole switch for any length of time (which is easily done). The repair engineer (contract, no strong affiliation to Triton) told me Tritons were junk and it was an issue he saw all the time with them. If you never ever forget to turn off the pole switch after use, you may never have a problem, but it seems beyond Triton to incorporate a protection circuit just in case. We've never switched the pole switch off and its just gone (fires out boiling water on the highest flow). Stick it on lower flow and its hot but ok. Went about 2 months ago after being fitted about 8 years ago permanently poled on! I was unlucky with 3 tritons? Original one replaced twice within … I was unlucky with 3 tritons? Original one replaced twice within warranty. The next time it went out of warranty, it was binned and I got a Mira in that ran faultlessly for 7 years, before I moved house and don't know what happened since. Common issue - one of the capacitors on the two heating circuit boards pop very easily when you forget to turn off the pole switch for any length of time (which is easily done). The repair engineer (contract, no strong affiliation to Triton) told me Tritons were junk and it was an issue he saw all the time with them. If you never ever forget to turn off the pole switch after use, you may never have a problem, but it seems beyond Triton to incorporate a protection circuit just in case. Make your mind up was it 'A' Triton or three you had. Were you told to switch the double pole isolator off after use? I am of the opinion the double pole switch/pull cord is there for safety and maintenance, if the circuit complies with current regulations I see no reason to switch on/off each time the shower is used. No disrespect intended though I stand by my earlier statement, you were unlucky. Make your mind up was it 'A' Triton or three you had. Were you told to … Make your mind up was it 'A' Triton or three you had. Were you told to switch the double pole isolator off after use? I am of the opinion the double pole switch/pull cord is there for safety and maintenance, if the circuit complies with current regulations I see no reason to switch on/off each time the shower is used.No disrespect intended though I stand by my earlier statement, you were unlucky. Fitted correctly (10mm cable, 50A MCB), when one circuit went it was usable in the summer when inlet water temp is relatively high. As I said, the independent guarantee engineer said to get a Mira when out of warranty. He said half his trade was replacing Tritons for same issue as I had, and the boards were dearer than the whole unit. When people recommend 10mm cable - is this going all the way to the fusebox? When people recommend 10mm cable - is this going all the way to the … When people recommend 10mm cable - is this going all the way to the fusebox? Yes. It should be on it's own 40, 45 or 50A mcb. at 8.5kW, it could theoretically be drawing 35.5A, 40A is enough for 8.5kW, better to fit a 45A one in case you go 10.5kW in the future.